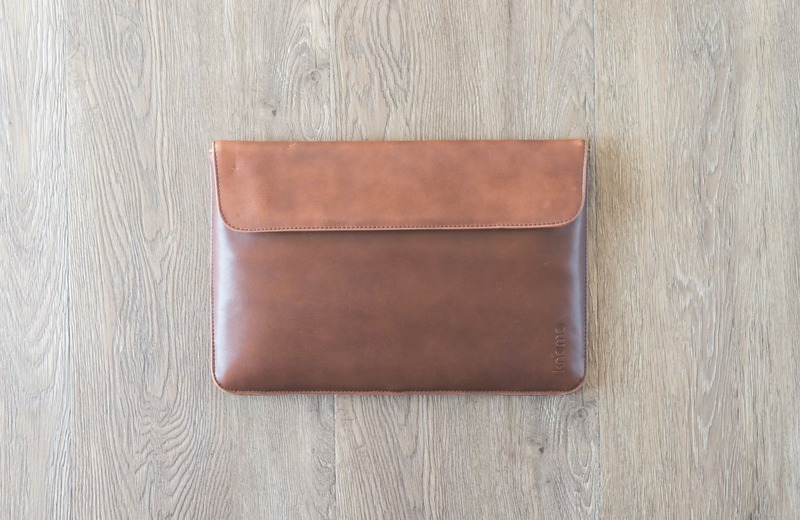 The Knomo Envelope sleeve isn't made for the 12” MacBook, but it's too beautiful to be used with only the 11” MacBook Air. I’ve been waiting to write this review for a very long time. Back in 2011, I purchased the second generation 11” MacBook Air with 4GB RAM and 64GB storage. I had a portable hard drive where I stored my iTunes and iPhoto libraries and kept everything down to a minimum on the laptop. And despite the abysmal four to five hour battery life, that little laptop was tons of fun to use. During my tenure with the MacBook Air, I went all out on a high-end Knomo Envelope Sleeve to stow and protect the laptop. Wherever I went, so too did my MacBook Air and Knomo sleeve. I was proud to use that tiny laptop. In reality though, I just wanted to show off my sleeve. Like every other device I seem to buy, I eventually sold that MacBook Air. But I couldn’t part with the Knomo sleeve. It was too pretty, too stylish, and really, too expensive to part with so easily. 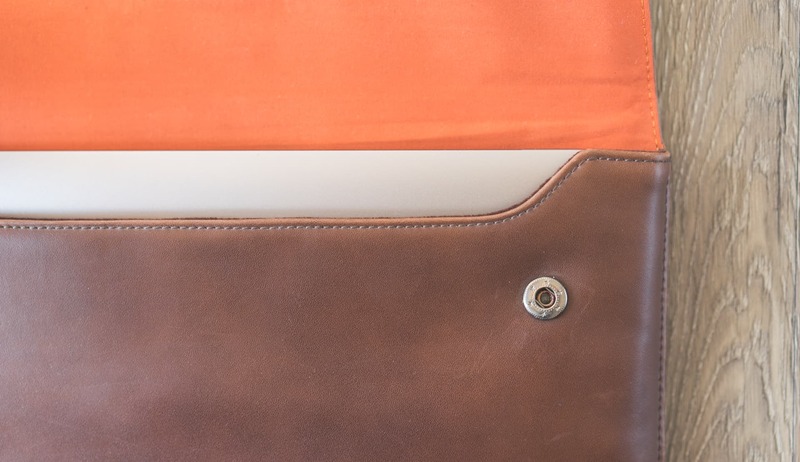 The Knomo Envelope Sleeve for the MacBook Air (and now MacBook) is a few years old already. I just couldn’t part with its flattering looks. So I kept it. For five years. Thinking one day, I’d eventually have an excuse to use it again. I’ve been a far off admirer of the 12” MacBook’s size and form factor, but the 2015 12” MacBook’s guts just couldn’t catch up to what I wanted. The 2016 12” MacBook is a different story; between a faster process, faster storage, and what I believe to be an improved keyboard, the latest 12” MacBook is everything I hoped for. It just so happened to fit in my beloved Knomo Envelope sleeve. So why this long background story? 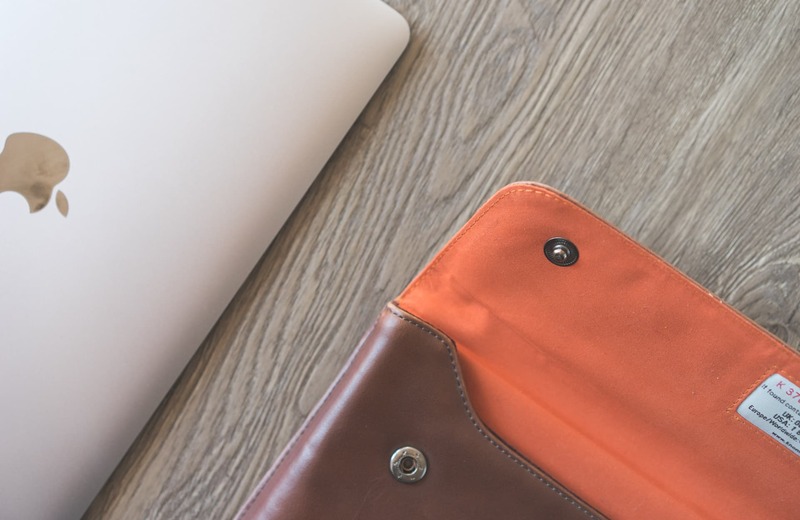 Because the Knomo Envelope sleeve isn’t actually designed for the 12” MacBook. It’s designed for the 11” MacBook Air. If you like leather goods as much as I do and you decide to pick up this sleeve, don’t expect an absolutely perfect fit. The Knomo Envelope is neither minimal or maximal. It’s simple enough to be nothing more than what you see, but it’s not just a slab of leather either. 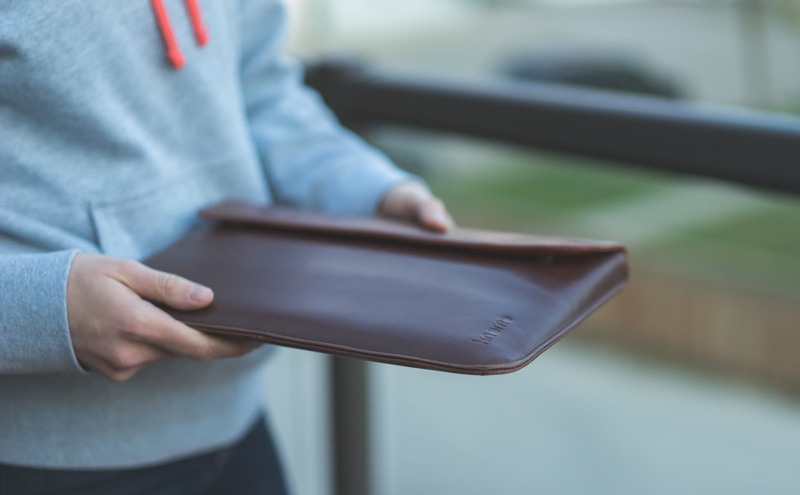 The Knomo isn’t a raw or unfinished leather. Instead, it’s been treated to feel smoother in your hand. This helps it handle scratches and scrapes better than other leathers I’ve seen. The leather exterior is coated and ever so slightly shiny. It’s a bit more slippery than other leather products I have kicking around the house and it may even come across as non-genuine leather. Rest assured, it’s a finished leather. As mentioned, the case doesn’t age as quickly as other leather products I own. I chalk this up to how the leather is finished, but it could be a different factor. 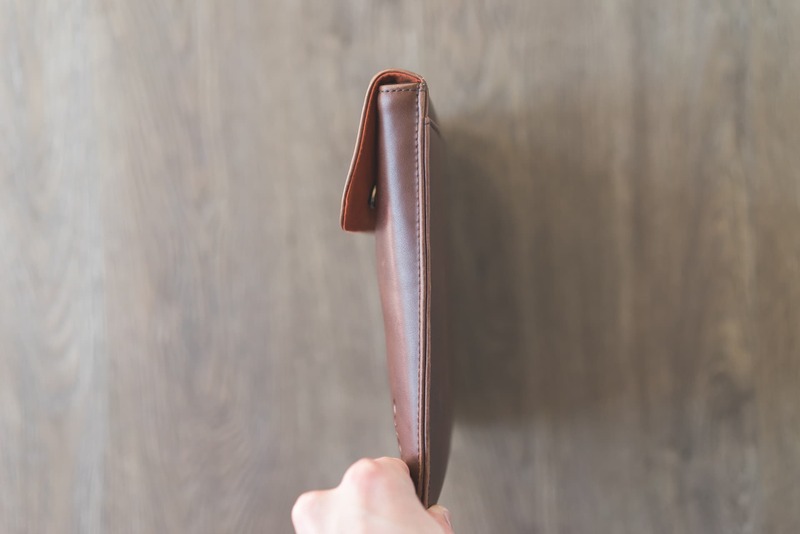 Because it’s a finished leather, the Knomo Envelope doesn’t carry its everyday bumps and bruises like ONA leather camera bags or the leather Hellbrand Field Notes cover. I’ve had this leather sleeve for five years, and although that’s not five years of extended use, that’s still five years of bumps. You can hardly see any scars on the Knomo’s face. 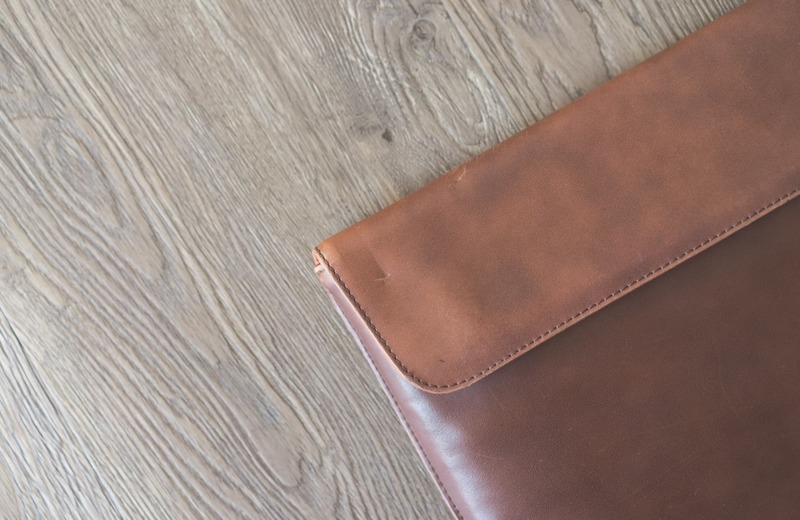 One of my favorite leather products, the Hellbrand Field Notes cover, has beautifully burnished edges. Unfortunately, the edges on the Knomo aren’t as well done. Regardless, they are stitched nicely and I’ve had zero fraying in my five years of ownership. 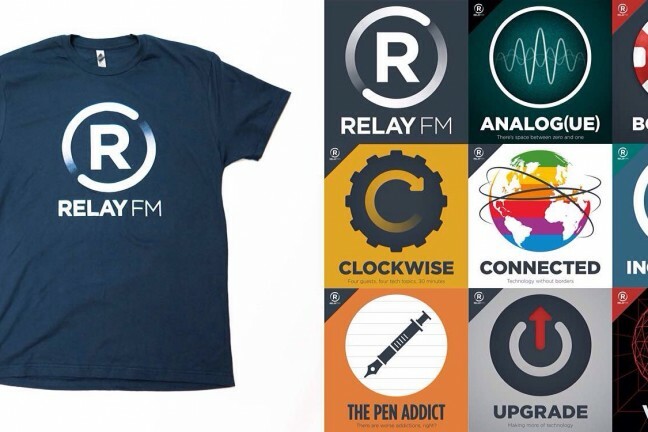 More importantly though, the Knomo logo is debossed wonderfully into the right corner. It looks and feels fantastic. Edges are stitched and finished, so there is no fraying to be found. I adore burnished edges on thick leather pieces, but alas, that’s not to be found with the Knomo. 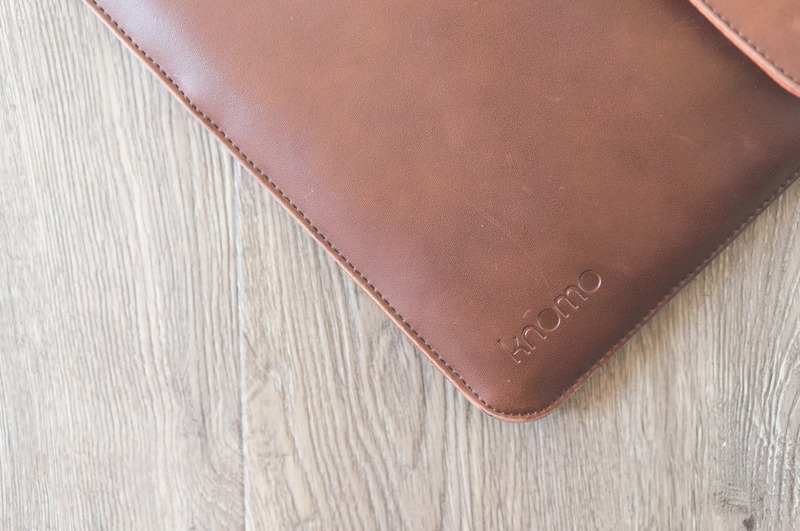 The Knomo logo is appropriately debossed into the leather. Really, is there any other aesthetically pleasing way to brand a piece of leather? I don’t think so. It’s pretty easy to see you should slide your MacBook in with the thin edge down. 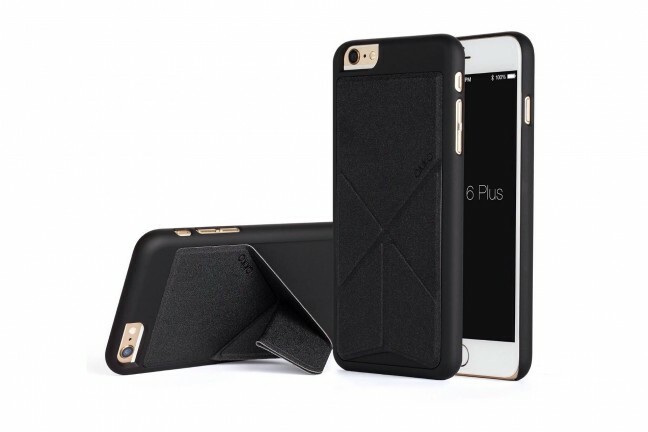 The shape of the sleeve largely matches the tapered design of the MacBook Air and MacBook. Hinge side of the MacBook facing up — easy as that. 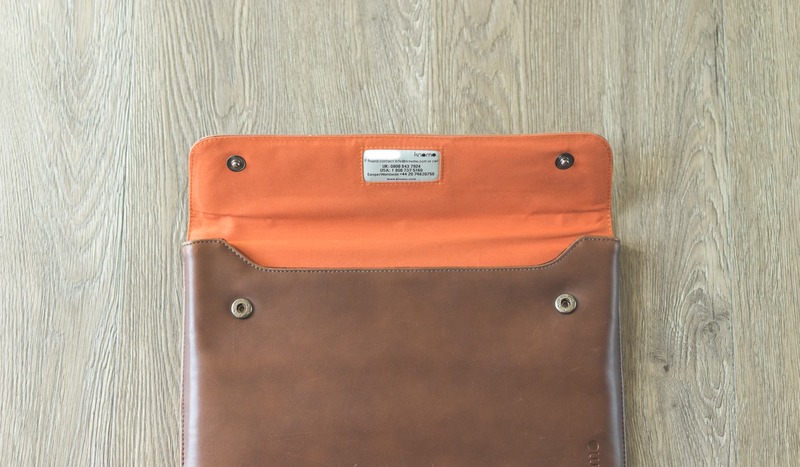 Opening the flap reveals an orange nylon material that is met with beautifully soft felt. The felt on the inside of the sleeve is wonderfully soft and plush, but the protection stops about there. There isn’t hard plastic or protective cushioning anywhere in the sleeve. You could drop the sleeve with the MacBook inside, but the sleeve isn’t bulletproof. There is an information patch stitched into the middle of the flap which has all the information needed for the Register my KnomoID program. More on that in a bit. The Envelope Sleeve closes via these snap buttons, which have held up well over time. I keep expecting them to fail or break, but I have yet to be disappointed. They do pose a different problem, mind you. The only other design detail are the snap buttons. These heavy duty snap buttons are an elegant enclosure solution and help maintain the relatively minimal appearance. They snap open and closed with proper feedback and, although you have to snap them closed blindly, it’s easy enough to line up the buttons without looking. Despite being an elegant solution, those snap buttons are the only major downside of the Knomo Envelope. Once opened, the buttons often come into contact with the bottom of your MacBook as you pull it out of the sleeve. On occasion, there’s that horrible metal-on-metal scraping sound. The male component of the snap buttons is one drawback of the sleeve. As they are solid metal and fairly large and durable, you’ll likely find the bottom of your MacBook scraping up against the buttons when pulling out your laptop. As you can see to the left, the snap buttons are positioned perfectly to provide a large amount of friction, scraping, and scratching to the bottom of your MacBook. Looking at the sleeve, I’m not sure how else Knomo could have designed the closure in order to look minimal and stay secure, but you may find scratches on the bottom of your MacBook if you’re not careful. Sliding the MacBook into and out of the sleeve poses no issues though. The leather is flexible enough to open with ease and allows your finger tips to get inside without any issue. As mentioned, the Knomo Envelope was originally designed for the 11” MacBook Air, so the small difference in dimensions with the 12” MacBook make it a little more snug than I remember the MacBook Air being. The MacBook has about a quarter-inch on either side to move a bit when the sleeve is closed, but it’s just slightly more snug north and south. All this being said, it’s a non-issue and poses no everyday problems. The Knomo Envelope doesn’t have any extra pockets or sleeves, so I find myself carrying it inside my messenger bag to work for the day. If I need to head to a coffee shop to work, I can leave my bag behind and just take the sleeve. The Envelope is business-y enough to carry on its own, but if you need a charging cable, you’ll either have to carry it separately or inside a different bag. I like carrying a MacBook as-is inside the sleeve, but I carry the MacBook inside the Knomo inside my messenger bag more often than not. 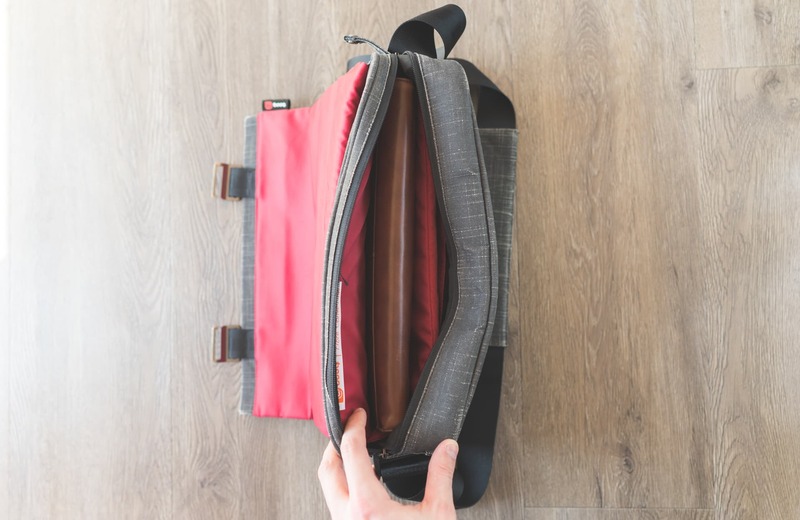 The Knomo is thin enough to fit into a messenger bag, so you can still bring extra doodads in your bag and carry the Knomo on its own when it suits. A nice little addition to all Knomo products is a “Lost and Found” program. Inside the flap of the Envelope is a patch with a serial number, URLs, and phone numbers you can call or visit in case you find or lose a Knomo product. Using the information in the little patch on the inside of the flap, you can register for Knomo Envelope in case you lose it. If you find a Knomo, simply visit their website, type in the serial number (whited out above), and notify the owner where their Knomo is. The program requires everyone to sign up, but it shows Knomo cares to keep their customers happy. After you purchase, head over to the Knomo site to register your serial number. If you do lose your sleeve, Knomo will do everything they can to get the sleeve back in your hands. If you find a Knomo, simply visit the URL and pop in the serial number on the patch. It’s a fairly simple process, but requires both parties to participate. 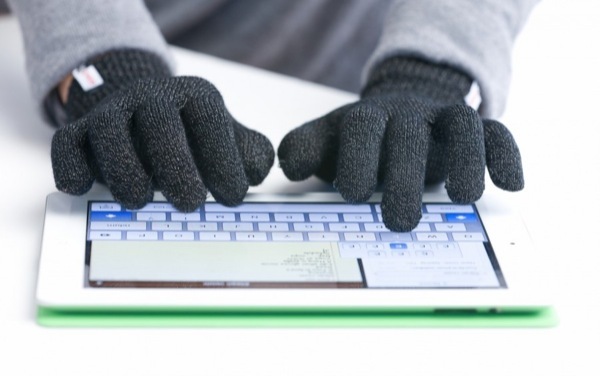 It’s also relatively useless in terms of theft — my wife had a Knomo sleeve for her MacBook Air and it was stolen from her at school. Of course, no smart thief would call in their own crime. When I purchased the Knomo Envelope for the 11” MacBook Air, I gulped hard and dropped over $100 for the sleeve. It just captured my leather heart and I couldn’t say no. Luckily, that price has dropped significantly since 2011. You can get the Knomo Envelope sleeve in a brown leather for only $45 on Amazon right now, or you can get a high gloss red leather Knomo or a high gloss black leather Knomo. Undoubtedly, I prefer the less shiny brown leather Knomo Envelope, but the red and black may be right up the alley of a different audience. Fortunately, both high gloss Envelopes retail for a mere $23. This is a great sleeve for a really affordable price. Knomo’s Envelope sleeve is a pretty straightforward product. 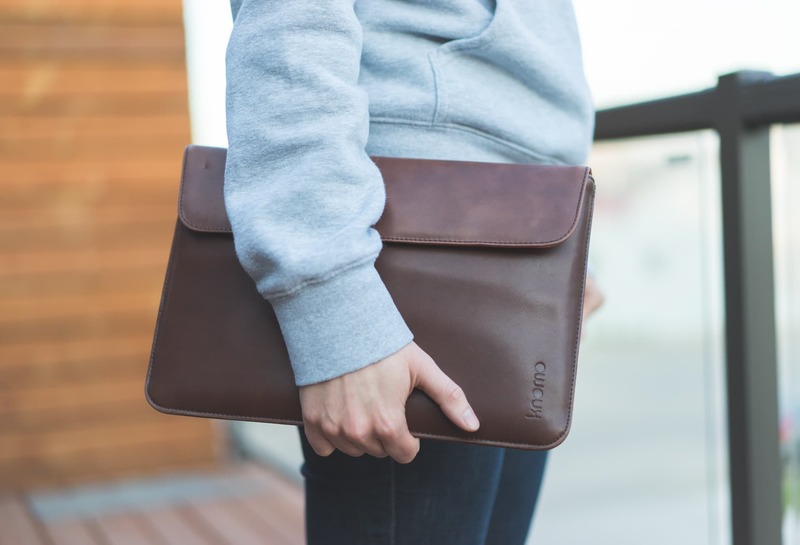 It’s simple and stylish and does a good job protecting your 12” MacBook or 11” MacBook Air when you’re out and about. It has a very business-y look, ensuring you can carry this sleeve no matter your profession, style, or taste. The heavy duty snap buttons work pretty well and haven’t broken on me in my years with the sleeve, but they do bump and scrape up against the underside of your MacBook when sliding out. I have no visible scrapes or buffs on the underside of my MacBook, but I’m also very careful with those snap buttons. When Apple released the 12″ MacBook, the most exciting part to me was the fact its dimensions were nearly identical to the 11″ MacBook Air. Not only would the footprint of the MacBook be tiny, it’d also fit in my Knomo Envelope Sleeve. This sleeve is a keeper and is worth every dollar I paid for it five years ago. Best of all — and I’m surprised I’m saying this — is the Knomo’s price. I bought this sleeve as a student, making the $100 even more difficult to swallow. Never once have I regretted that $100 purchase, but it was very expensive at the time. Now, you can pick up the Knomo for a mere $45. If you want something a little more high style, the red or black leather options are only $23. I definitely recommend the brown leather option — at $45, it’s a steal of a deal. 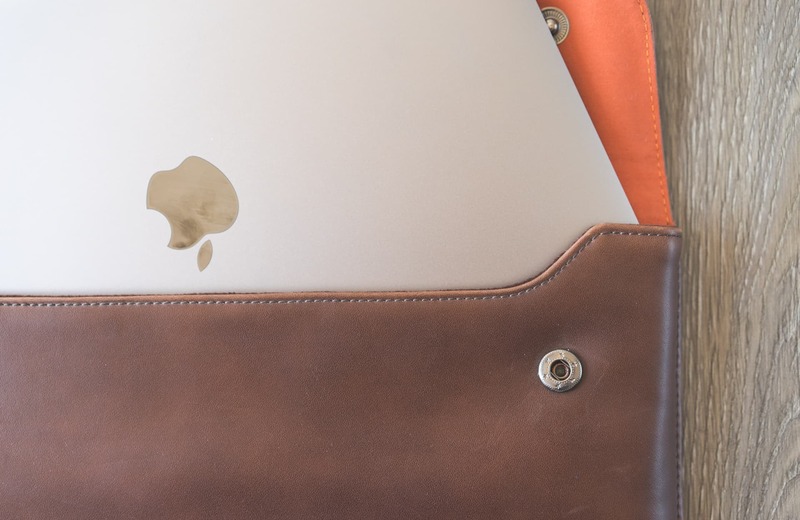 If you’ve got a 12” MacBook, this sleeve is a solid choice. It’s not made for the 12” MacBook, but the Knomo is too beautiful to be used with only the 11” MacBook Air.